Jamie Edmiston at Edmiston & Company calls to say that he's been appointed joint central agent, with Peter Insull's Yacht Marketing and Burgess, for the sale of the 85.3m motor yacht Alysia. Alysia was built by Greece's Neorion yard in 2005 and currently ranks at number 49 in Boat International's listing of the world's top 100 yachts. This superyacht is classed as a SOLAS passenger vessel and accommodates 36 guests in a master, VIP, eight double and eight twin cabins. Each stateroom is a mini-suite with a sofa, hand-made carpet, silk curtains, walk-in closets and ensuite marble bathroom. 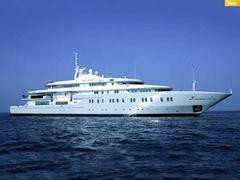 Alysia cruises at 16 knots and, at 14 knots, has an immense range of 7,000 nautical miles. On the market at €85 million, she's asking around one million Euros per metre.